Bananas the Tickle and Tumble Monkey is rated 4.5 out of 5 by 26. Tickle baby’s funny bone with help from Bananas – the giggliest monkey in the history of ha-ha. This rolling toy from Bright Starts turns tummy time into comedy hour. The laughter is contagious! 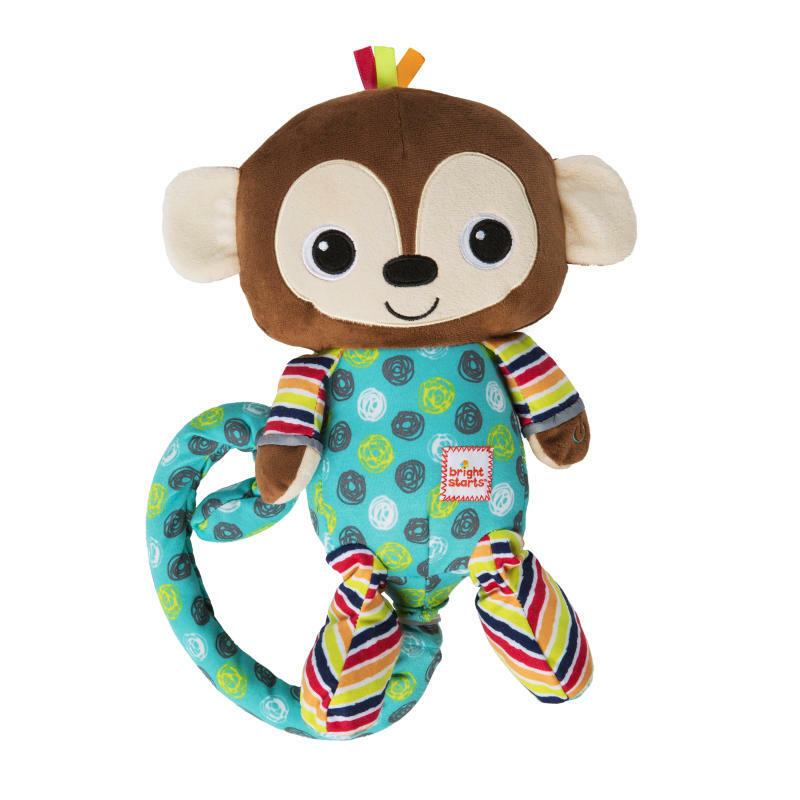 Your baby will light up and laugh out loud as he joins in the plush monkey’s giggle fest. Press Bananas’ hand to get the giggles going, and watch as his ticklish tail flips the monkey back and forth on the floor. When your baby is crawling, this baby chase toy has your little one on a mission… to catch a giggle! Monkey laughs hysterically and baby joins in! Dimension (in) 12" x 6" x 3.5"
Rated 1 out of 5 by Rydersmommy18 from Does not work! My 4 month old loves this toy. It worked fine in the store but as soon as I took it out of the box it doesn't roll it just laughs. Sad I have to take it back. What a disappointment! Rated 5 out of 5 by Vinessa from Funny monkey This toy is the cutest! I can't believe that it rolls over. I got this toy free to try. It is the perfect size for taking on the go too. Won't bulk up your bag. Rated 5 out of 5 by jsmith251 from My child loves playing with this toy! The monkey giggle and sounds are very entertaining. Helps her with her eye tracking as well as hand-eye coordination. A fun toy for us all! Rated 5 out of 5 by jsmith251 from My child loves playing wi My child loves playing with this toy! The monkey giggle and sounds are very entertaining. Helps her with her eye tracking as well as hand-eye coordination. A fun toy for us all! Rated 4 out of 5 by Ronnie from Fun toy! The Tickle & Tumble Monkey is a solid toy for a young child. My son has been enjoying playing with it as he develops his motor skills. Rated 4 out of 5 by momandteacher from Cute and bright While my daughter is still a little too young to fully enjoy this toy, she does like looking at the monkey and trying to grab at it. My older children like playing with it and enjoying playing with my daughter using the monkey. This is a cute toy and I would buy it to give as a gift to others. Rated 5 out of 5 by mzmyrtlez from This Little Monkey This little monkey is quite the tickle and the laugh. It interacts with my little making all types of noises. I love that this little money encourages movement, fine motor skills and learning. It is quite fun for baby and me. It comes with different sounds, is soft and affordable.